In the latter nineteenth century several British doctors, philosophers and naturalists embraced scientific principles as the ones upon which society should best form itself for the future. The theory of evolution, the atomic theory of matter and the theory of the conservation of energy were the core theories upon which this new group hoped to reshape society for the modern period. Historians now call this group of high profile Brits the “scientific naturalists”. Herbert Spencer, whose philosophical exposition of evolutionary principles for society became highly influential, John Tyndall whose essays on religion were widely read and debated, and Thomas Henry Huxley, who later acquired the name “Darwin’s bulldog”, were tireless advocates of this scientifically infused world-view. Title page of Herbert Spencer’s Social Statics: or, the conditions essential to Human Happiness, specified, and the first of them developed (London: John Chapman, 1851). Given their later influence upon the secular thought and intellectual life of Britain, it is interesting to trace the early careers of Spencer, Tyndall and Huxley back to the 1850s and the publishing company of John Chapman, a physician who later turned publisher. Chapman’s willingness to invest in publications at the intersection of freethinking, philosophy and religion, would prove highly influential upon Spencer, Huxley and Tyndall, who went on to promulgate similar ideas mixed in with their writings about science. Chapman published Spencer’s first major work Social Statics in 1851, while Tyndall and Huxley developed the science section of Chapman’s periodical, the Westminster Review. The Review was edited by Mary Ann Evans (better known as the novelist George Eliot) who by 1852 had developed with Chapman a vision for the periodical, which included evolution as a fundamental principle of progress. Therefore Chapman and his circle of authors, including Spencer, Tyndall and Huxley, had worked out their commitment to evolution and their interest in challenging religious and societal dogma some years before the publication of Charles Darwin’s On the Origin of Species in 1859. Besides challenging many conventions of the day in his periodical, Chapman introduced the English reading public to three seminal works that went on to greatly influence British nineteenth-century thought: David Friedrich Strauss’ Das Leban Jesu, Ludwig Feuerbach’s Das Wesen des Christentums, and August Comte’s Cours de Philosophie Positive. Evans translated Strauss’ Das Leban Jesu, which was released with the English title The Life of Jesus Christ Critically Examined, in 1846. She also translated Feuerbach’s Das Wesen des Christentums, which appeared as The Essence of Christianity in 1854. The social theorist Harriet Martineau translated Comte’s Cours de Philosophie Positive, which was published as The Positive Philosophy of August Comte Freely Translated and Condensed in 1853. Remarkably, Chapman entrusted two learned women with these tasks. While women writers were common in the period, entrusting editorship of a periodical to a woman (Evans) and working with a woman who publicly called for gender equality (Martineau) was unusual. Within the emotional landscape of Christianity and its contemporary challengers, reactions could be vehement. 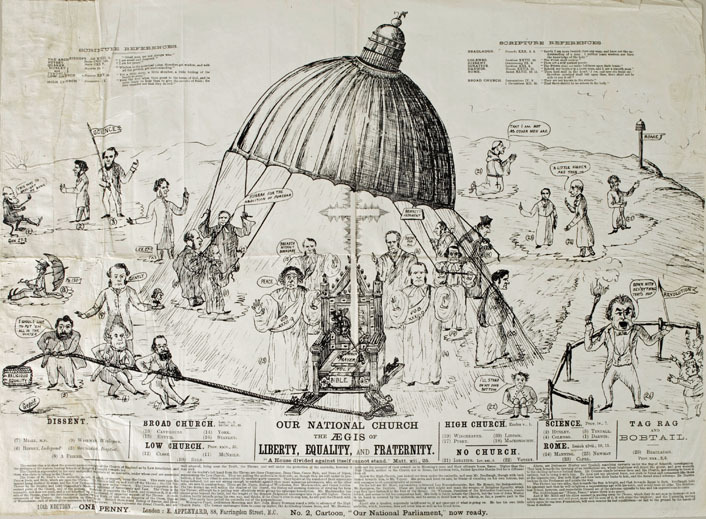 This broadsheet published by Appleyard for one penny (c. 1880s), depicts several notable contributors to religion and science debates from the 1880s. John Tyndall, Thomas Huxley and Charles Darwin are shown as advocates for “Science” among the parties vying to define Christianity. “Our National Church: The aegis of Liberty, Equality, and Fraternity”. (Source: Whipple Museum of the History of Science, University of Cambridge, Wh.5935. Copyright: Whipple Museum, used with kind permission). Through contact with Comte’s philosophy, Spencer reinterpreted evolution as the progressive development of the physical world, universe, biological life, and society. Although Darwin’s concept of evolution was non-progressive and random, it was Spencer’s progressive evolutionary philosophy that was most widely read, as his popularity grew towards the end of the nineteenth century. Tyndall, Spencer and Huxley went on to walk a thin line between accusations of materialism and advancing their cause to supplant religious leaders with scientific ones. The publisher John Chapman, had forged social connections with several of the scientific naturalists and began espousing their thinking on evolution and its associated social philosophy prior to both Darwin and Alfred Russel Wallace’s publications on the theory of evolution by natural selection. Chapman’s association with these men invested them with radical philosophical and religious ideas, prepared them to be involved with publishers and public writing their whole careers, and possibly, gave them the ammunition to go forth as advocates for Darwin and evolutionary theory in the face of religious objections after 1859. ← What is the history of “Antievolution”?